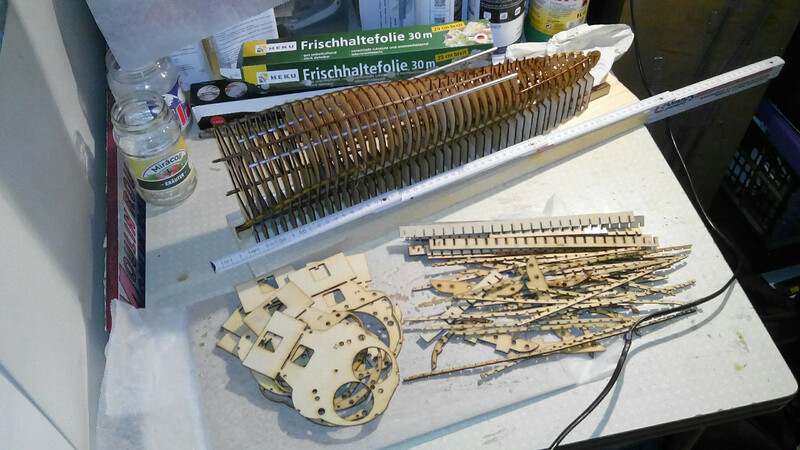 some thoughts of building a VIIC fully functional model uboat made out of plasticized finnboard. The basic idea is to scan in the frame drawing and redraw the frames within a CAD porgram, export to FreeCAD and create a 3D model for further development. The frames will be laser cut out of 2mm finnpaper. The plasticzing is done with resin. I've done 48hrs watering tests with this material and it shows no signs of expansion or additional weight. 1) Import the frame scan into LibreCAD (or your favorite proggi) and scale it to your needs. Be aware that this uboat type is made out of circular elements. So you can rest assure when doing the main redrawing with arc and straight lines. The scanned image is definetly not XY aligned ! 2) Import the DXF to FreeCAD, check the SKETCHER import, move the SKETCHER Z-plane to the coordinates of the frame. I'am using DXF2GCODE and GCODESENDER software to send the DXF file to the laser cutter. You can see in this picture my layer naming convention, which will also do the settings for the laser cutter in go. The -T:NN determines how often the laser has to run this layer, F and Fz are the speed settings. The top rectangular part of the frame is for the building slip and will be cut off when the section is finished. 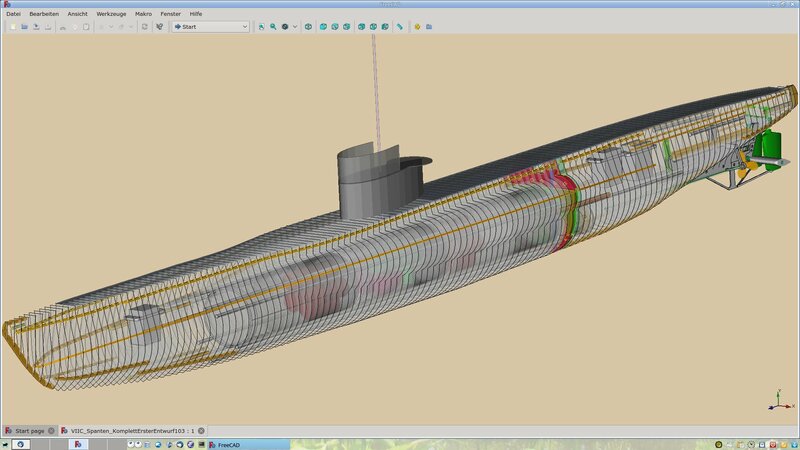 # Helper Tool for VIIC Uboat design. # Distances of Frames to Frame0 and Fram54(COG) resp. # Taken from the Frame Body Drawing 1939. # Should go with U551-U562 and some others. # Output of Frame 54a is omitted for simplicity. My 2,5Watt laser cutter. It would be better to have more power i.e. 8Watt or so to speed up the cutting. The original redrawn plans i have show the VIIC U-551 to U-572 with an additonal frame 54a. All in all i drew 133 frames. When imported into FreeCAD you can select the Stringer connection points, draw lines in between and export to DXF. The final Stringer drawing was done in the CAD program and reimported to FreeCAD. Sounds cumbersome and it is to some extend, but i cannot do CAD work efficiently with the FreeCAD drawing tools. Attached pls find a FreeCAD file to play with. 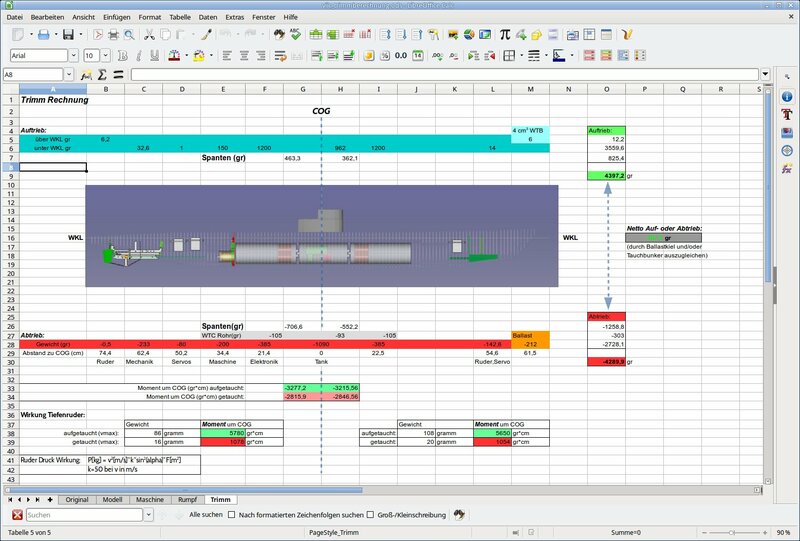 To be sure that the uboat is working as expected you may take the spreadsheet for calculating the trim and some other parameter according to Froud. Do not get carried away because i don't have the weight/volumes for all the parts now. So this is an estimation. But it shows that the overall design can be balanced. Last edited by hds on Tue Mar 06, 2018 3:09 pm, edited 2 times in total. detail of the heck rudder system. It shall be removable for maintenance. FreeCAD helped a lot to find the best shape and construction details. Last edited by hds on Tue Mar 06, 2018 7:15 am, edited 1 time in total. The bow and aft section seperator part, aft rudder holder and the 48hrs water test (on the right). 2 design studies for the aft rudder section. It has to slide into the bottom cutout of the frames. extremely cool project. About "full functionality": does that mean, the model can submerge? I fly RC planes and helicopters. Never got around to boats and uboats! How will you SKIN the sub? I guess you will just ballast to neutral bouyancy to go subsurface??? Will you need a speed controller? If so, how will you discard heat if that is even necessary? Could you explain more about how YOU imported DXF into Sketches. great. 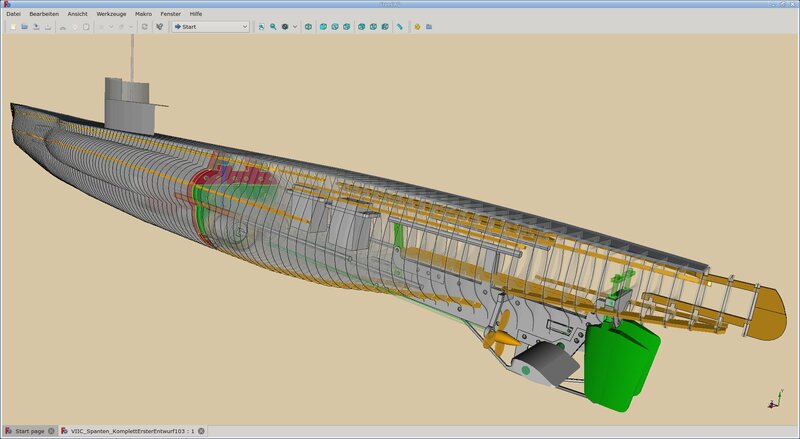 a good example to see that FreeCAD is ready for production. and a lot of work done here - without heavy help requests in the forum. No waeponary. I can't stand that bang bumm peng stuff. b) There exists a "Planrolle VIIC" from Köhl and Niestle for some 40EUR. 7 A0 sheets. OR you need to google some of these plans on the net. The quality of the pictures varies significantly. c) Finnpaper should be something like "finnish cardboard". Thicknesses i use are 1; 2 and 3mm. It is very googd for laser cutting ! You have a smooth and a slightly more "paperish" surface. Turn the smoothy one towards the laser. I've seen once a very large cardboard ship which was fully operational. The owner said it could do 2 hours in water because the cardboard has been impregnated with paint. d) The hull will be made from finnboard 0,5mm thick in 2 layers. Some areas need to be laser cut. Basically the same technique as for sailing ships made from wood. f) Motors will get a watertight alu casing. The speed controller can simply be dumped directly into water with a little insulation. So i do not expect any heating problems there. 1) Create a DXF sketch. 2) Import into FreeCAD. It will be placed in the XY plane ! Thats why i used the Z vector for the aft-bow direction. 3) Workbench PART DESIGN -> Approve sketch. Adjust the "similar" point distance to your needs. I use 0.01mm. Check and Approve. Check if you can extrude the part. If NOT, than SKETCHER -> Select two line ends i.e. a visible single point -> Constraint POINT. After this op the part should be extrutable. 4a) Set the Z offset. 4b) Or go to DRAFT and rotate the part into the plane needed. Last edited by hds on Tue Mar 06, 2018 7:17 am, edited 1 time in total. Redid the 133 frames with splines so that i could use the new FC 0.17 DXF spline import function. This way opens the possibility for lofting the hull. Motor section. The basic idea of how to do it. According to the spreadsheet i will take two 850KV 12V motors. During the import of the DXF into FreeCAD a lot of DRAFT elements will be created plus a group. I delete them all and keep only the created sketch.